I do not pray to the Supreme Personality of Godhead for the eight perfections of mystic yoga, nor for salvation from repeated birth and death. I want only to stay among all the living entities and suffer all distresses on their behalf, so that they may be freed from suffering. Vasudeva Datta made a similar statement to Sri Caitanya Mahaprabhu, requesting the Lord to liberate all living entities in His presence. Vasudeva Datta submitted that if they were unfit to be liberated, he himself would take all their sinful reactions and suffer personally so that the Lord might deliver them. A Vaisnava is therefore described as being para-duhkha-duhkhi, very much aggrieved by the sufferings of others. As such, a Vaisnava engages in activities for the real welfare of human society. Vasudeva Datta, the nineteenth branch of the Sri Caitanya tree, was a great personality and a most confidential devotee of the Lord. One could not describe his qualities even with thousands of mouths. Vasudeva Datta, the brother of Mukunda Datta, was also a resident of Cattagrama. In the Caitanya-bhagavata it is said, yanra sthane krsna haya apane vikraya: Vasudeva Datta was such a powerful devotee that Krsna was purchased by him. Vasudeva Datta stayed at Srivasa Pandita’s house, and in the Caitanya-bhagavata it is described that Lord Caitanya Mahaprabhu was so pleased with Vasudeva Datta and so affectionate toward him that He used to say, “I am only Vasudeva Datta’s man. My body is only meant to please Vasudeva Datta, and he can sell Me anywhere.” Thrice He vowed that this was a fact and that no one should disbelieve these statements. “All My dear devotees,” He said, “I tell you the truth. My body is especially meant for Vasudeva Datta.” Vasudeva Datta initiated Sri Yadunandana Acarya, the spiritual master of Raghunatha dasa, who later became Raghunatha dasa Gosvami. This will be found in the Caitanya-caritamrta, Antya-lila, Sixth Chapter, verse 161. Vasudeva Datta spent money very liberally; therefore Lord Caitanya Mahaprabhu asked Sivananda Sena to become his sarakhela, or secretary, in order to control his extravagant expenses. Vasudeva Datta was so kind to the living entities that he wanted to take all their sinful reactions so that they might be delivered by Sri Caitanya Mahaprabhu. This is described in the Fifteenth Chapter of the Caitanya-caritamrta’s Madhya-lila, verses 159 through 180. Srila Vasudeva Datta Thakura wanted to suffer for the sinful activities of all the people of the world so that Lord Caitanya Mahaprabhu might deliver them. CC Madhya 15.158 — Śrī Caitanya Mahāprabhu then embraced Vāsudeva Datta and began to speak of his glories as if He had a thousand mouths. CC Madhya 15.159 — When Caitanya Mahāprabhu glorified him, Vāsudeva Datta immediately became very much embarrassed and shy. He then submitted himself, touching the Lord’s lotus feet. CC Madhya 15.160 — Vāsudeva Datta told Caitanya Mahāprabhu, “My dear Lord, You incarnate just to deliver all conditioned souls. I now have one petition, which I wish You would accept. CC Madhya 15.161 — “My Lord, You are certainly able to do whatever You like, and You are indeed merciful. If You so desire, You can very easily do whatever You want. CC Madhya 15.162 — “My Lord, my heart breaks to see the sufferings of all the conditioned souls; therefore I request You to transfer the karma of their sinful lives upon my head. CC Madhya 15.164 — When Śrī Caitanya Mahāprabhu heard Vāsudeva Datta’s statement, His heart became very soft. Tears flowed from His eyes, and He began to tremble. In a faltering voice He spoke as follows. CC Madhya 15.165 — Accepting Vāsudeva Datta as a great devotee, the Lord said, “Such a statement is not at all astonishing because you are the incarnation of Prahlāda Mahārāja. It appears that Lord Kṛṣṇa has bestowed complete mercy upon you. There is no doubt about it. CC Madhya 15.166 — “Whatever a pure devotee wants from his master, Lord Kṛṣṇa doubtlessly grants because He has no duty other than to fulfill the desire of His devotee. CC Madhya 15.167 — “If you desire the deliverance of all living entities within the universe, then all of them can be delivered even without your undergoing the tribulations of sinful activity. 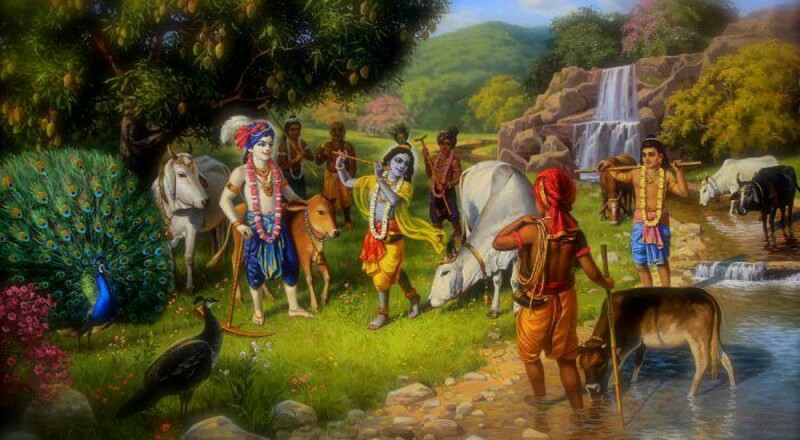 CC Madhya 15.168 — “Kṛṣṇa is not incapable, for He has all potencies. Why would He induce you to suffer the sinful reactions of other living entities? CC Madhya 15.169 — “Whosever welfare you desire immediately becomes a Vaiṣṇava, and Kṛṣṇa delivers all Vaiṣṇavas from the reactions of their past sinful activities. CC Madhya 15.171 — “Because of your honest desire, all living entities within the universe will be delivered, for Kṛṣṇa does not have to do anything to deliver all the living entities of the universe. The Gaura-ganoddesa-dipika (140) describes that Vasudeva Datta was formerly Madhuvrata, a singer in Vrndavana. I am so sorry regarding my limitations to serve all of the devotees of Lord Sri Krsna, improving everyone’s happiness, and minimizing hellishness. Srila Prabhupada, founder of ISKCON, had preached about Vasudeva Datta a number of times. Srila Prabhupada would compare Vasudeva Datta to Lord Jesus Christ. I know that for some people there could be some difficulty understanding how Vasudeva Datta could be compared to Lord Jesus Christ. I am just wondering if the message of Lord Jesus Christ had gotten around in India even during the pastimes of Sri Caitanya Mahaprabhu. Perhaps Vasudeva Datta wanted to suffer for “conditioned souls” something like Lord Jesus Christ and some of his followers had done. If we study the text and translations of Sri Caitanya Caritamrta presented by Srila Prabhupada and ISKCON we can see that apparently Sri Caitanya Mahaprabhu is granting Vasudeva Datta’s wish to save all souls in the universe. According to the belief, faith, and religion of Vaisnavism; Sri Caitanya Mahaprabhu is actually Lord Sri Krsna in disguise. He would therefore be able to grant Vasudeva Datta’s request. Regarding the comments believed to have been made by Sri Caitanya Mahaprabhu regarding being purchased or sold – this is also Lord Sri Krsna speaking. In other words, I am inclined to believe that Sri Caitanya Mahaprabhu is engaging in very advanced pastimes of loving exchanges with His most advanced devotees. I do not believe this is actually advocating any kind of slavery in the material existence. The humble request is to please pray for the dedicated followers of ISKCON and help the Vedabase devotees as much as possible if it is not too much difficulty. Please note their contact information at the bottom of the pages with Vedabase online. I was told they need to completely re-create and update the Vedabase research software. Here is some contact information for your convenience. Please keep me informed how I can do more to serve Krsna Katha and becoming conversant in the science of Krsna consciousness.